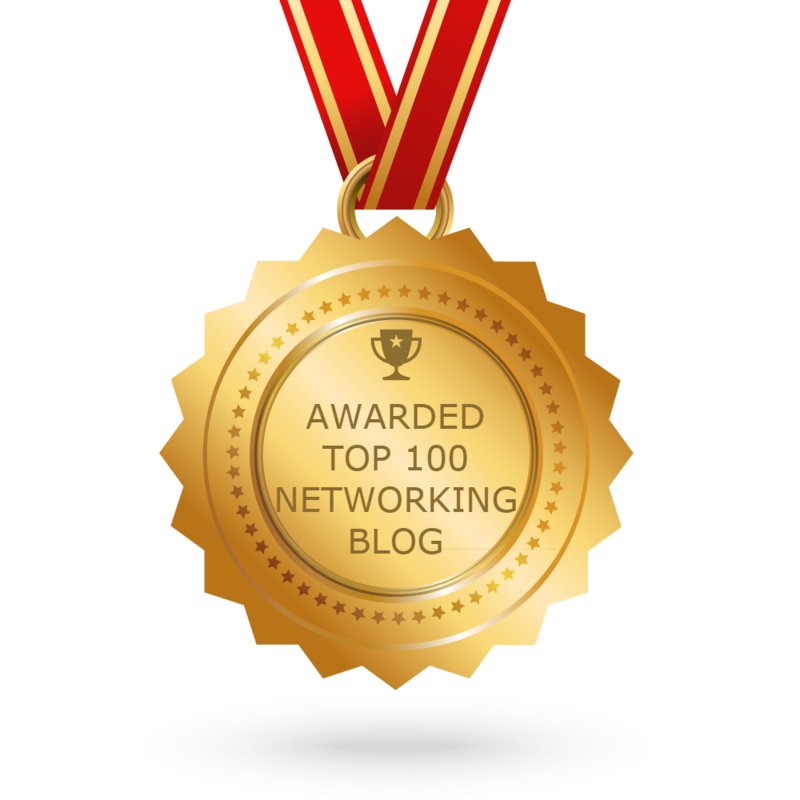 What’s the Cisco ASA with FirePOWER Services? It is a new, adaptive threat-focused, next-generation firewall that combines proven ASA firewall with Sourcefire threat and advanced malware protection in a single device. FirePOWER services can be added to existing ASA 5500-X and ASA 5585-X deployments or included with new deployments of those firewalls. Cisco ASA with FirePOWER Services is centrally managed by the Cisco FireSIGHT Management Center, which provides security teams with comprehensive visibility into and control over activity within the network. Such visibility includes users, devices, communication between virtual machines, vulnerabilities, threats, client-side applications, files, and web sites. Holistic, actionable indications of compromise (IoCs) correlate detailed network and endpoint event information and provide further visibility into malware infections. Cisco’s enterprise-class management tools help administrators reduce complexity with unmatched visibility and control across NGFW deployments. Cisco FireSIGHT Management Center also provides content awareness with malware file trajectory that aids infection scoping and root cause determination to speed time to remediation. Cisco Security Manager provides scalable and centralized network operations workflow management. It integrates a powerful suite of capabilities; including policy and object management, event management, reporting, and troubleshooting for Cisco ASA firewall functions when utilizing Cisco FireSIGHT Management Center. For local, on-device management including deployments for small and midsized businesses, Cisco Adaptive Security Device Manager (ASDM) 7.3.x provides, access control and advanced threat defense management. ASDM V 7.3.x provides an enhanced user interface that provides quick views on trends and the ability to drill down for further analysis. 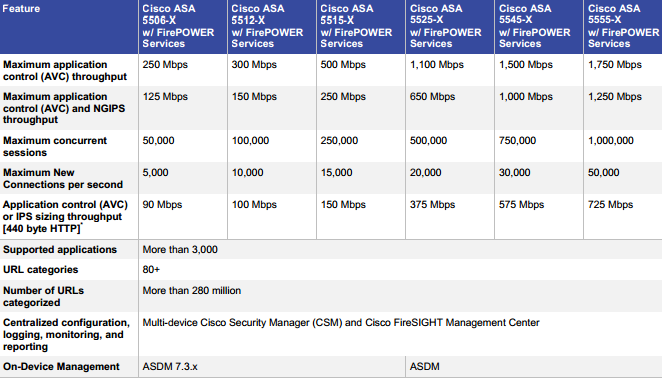 The Following figure details the NGFW capabilities and capacities of the Cisco ASA with FirePOWER Services for Cisco ASA 5500-X Series. Cisco ASA with FirePOWER Services include Cisco ASA firewalling, AVC, URL filtering, NGIPS, and AMP. 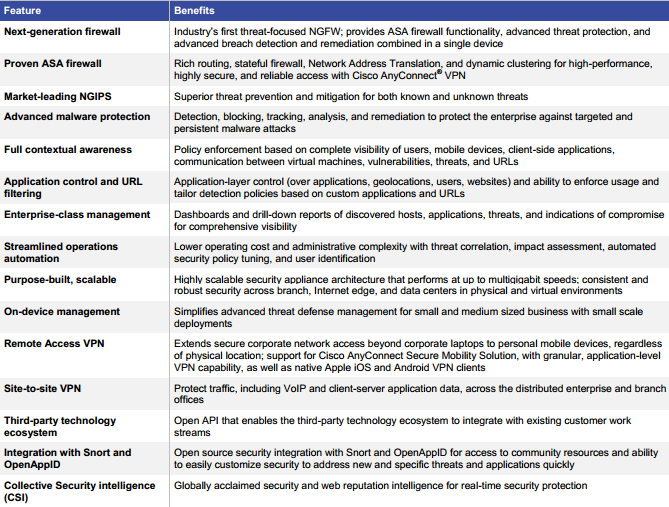 This unique set of capabilities is available on the Cisco ASA 5500-X Series NGFW platforms: Cisco ASA 5506-X, 5512-X, 5515-X, 5525-X, 5545-X, 5555-X, and 5585-X with Security Services Processor SSP-10, SSP-20, SSP-40, and SSP-60. The Cisco ASA 5585-X FirePOWER Services SSP-10, SSP-20, SSP-40, and SSP-60 hardware blades are supported on the Cisco ASA 5585-X platform. Cisco ASA 5585-X SSP-10, SSP-20, SSP-40, and SSP-60 firewalls require Cisco ASA Software Release 9.2.2 and later. 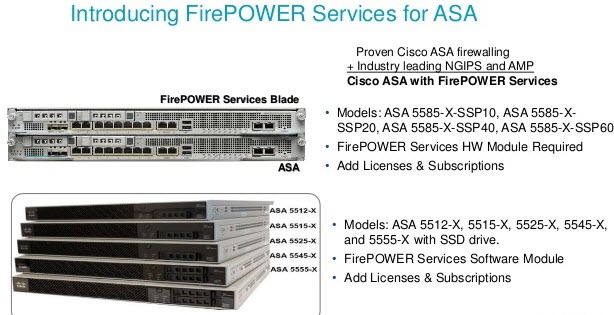 Cisco ASA with FirePOWER Services software is supported on the Cisco ASA 5500-X Series of next-generation midrange security appliances running Cisco ASA Software Release 9.2.2 and later.